I really enjoy these kinds of “historical short story” non-fiction books. This book is in the same vein as Jennifer Wright’s books and I was all over those so this is right up my alley. 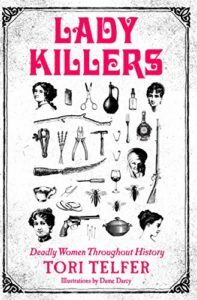 Tori Telfer goes back through the ages, and around various parts of the world to pretty much debunk the myth presented by FBI profiler Roy Hazelwood in 1998; namely that there are “no women serial killers.” She has any number of women here in this book that handily fit the bill. Some of these women, like Elizabeth Bathory, I had heard of, and many others I had not, such as Darya Nikolayevna Saltykova a psychopathic Russian noblewoman who tortured and killed over a hundred people and almost got away with it simply because serfs weren’t really considered people in the same way nobles were. There is also Nannie Doss, aka The Giggling Granny, who killed at least 11 people, mostly men who answered Lonely Hearts letters. I realized while reading her chapter that while I hadn’t heard of her, I had seen many fictionalized stories that used her story as a basis. Tori Telfer has a really strong voice and does a lot to cut through the male shift that most of the stories have been told though and handily dismisses the tropes and the excusing “hormones,” “misunderstandings” and “Female frailty” imposed upon many of these women over the years to either explain or downplay their crimes. She also shines a bright light on the realities of the circumstances that these women were in at the time, not as excuses but as real, contributing factors in the creation of a monster. If you are also a fan of Mary Roach or Jennifer Wright you should check this one out as well. Share the post "Femme Fatale"
My Third Cannonball! My goal this time around is to make the Half and get at least one bingo if we play bingo again. No female serial killers? Had he never heard of Angels of Mercy?